My crab Ozark has come up from another molt and he is HUGE. I'm worried now that it may be too crowded because my tat is only a 40g. With five crabs of all different sizes, I'm worried for the larger crabs as they approach the "jumbo" size. Koa is due to come up soon too if he's molted again, and I know if Ozark has gotten this huge, Koa has gotten even bigger. Koa was always the largest of the five. With all of that being said, Should I move the two small crabs to another tank when possible, or will it be fine for the large crabs because of the small size of my other crabs? We do not have much room for a larger tank, which is why separation is what I'm looking at. All in all, I'm trying to give the best care to all of my crabs and assure that they're thriving in the best conditions I can give, as all of you are! If I do have to separate them, how would you all recommend I do so? -Koa will possibly be in a 1 1/2" - 2" shell if he has molted again, as well as Moja. -Koa, Moja, and Ozark are my three large crabs. -Siam and Chella are around the same size, but Chella probably is a weeeee bit bigger.. This is the HCA guide for crab and tank sizes....how does it compare to what you have now? curlysister wrote: This is the HCA guide for crab and tank sizes....how does it compare to what you have now? Ah, My guys are fine for a while then, thank you! I checked multiple sources and my "large" crabs are actually just medium. All I have to worry about now is substrate, new pools, and more shells because I only have a few 1" to 1 1/2" shells and one 2" shell. Darn it the shells are expensive when the crabs get big! I spent $12.50 each on the last two shells, and Sonny doesn't like either one of them! $12.50 on two shells? Aw jeez.. Also, large shells don't come in large bulks like smaller shells do either..
$12.50 each! So $25 for the two! And US dollars at that, LOL! And he just changed into a shell that I had had in the tank for like a year and he never wanted before! I was noticing that when I was shopping as well. I am coming to the end of my shell sizes was looking around. My guy isn't to big yet, but the prices depending on the one you want to offer can be expensive. 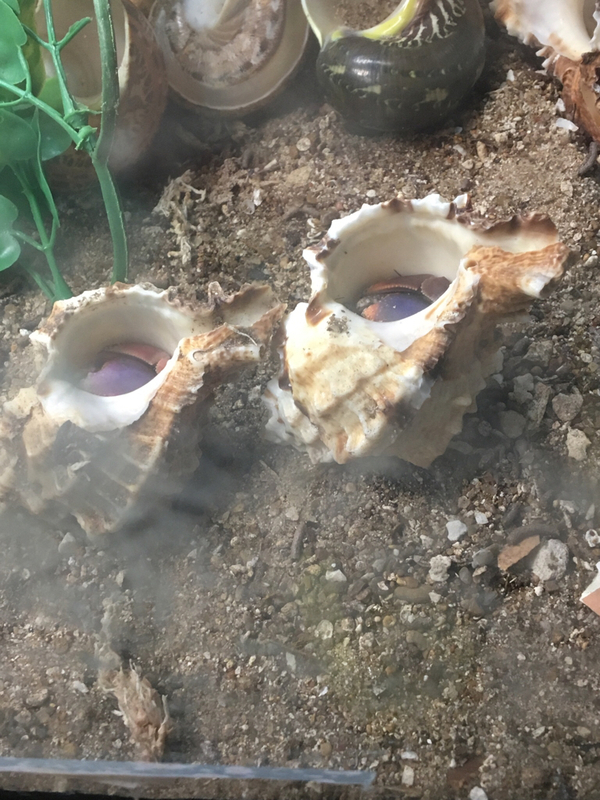 I just recently got a set of apple murex shells from Deltona Seashells and after boiling them in Prime treated water, only one of my crabs took one of the new shells and that was Buckbeak. He moved out of the Mexican turbo and he never went back to it. 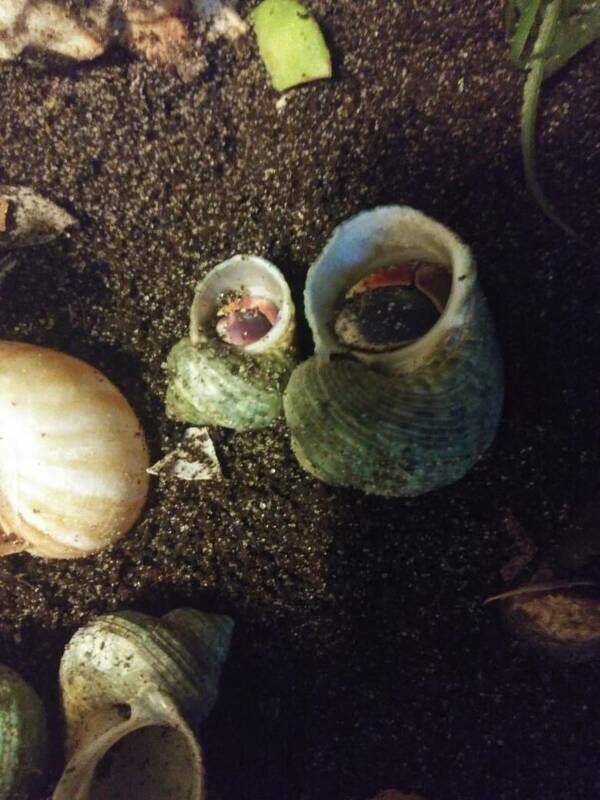 Violet has yet to show interest in changing shells. They may not be what she wants or she’s not ready to change pants. Here is the size difference between Buckbeak and Violet. Buckbeak I believe is borderline large, while Violet is a medium sized crab. By the way, the shell Buckbeak is in has a 1 1/8” opening.